Anticipated for weeks, the progressive jackpot at Slotland.com has just been hit for a record-breaking $200,111 (€150,980). A player at the all slots and video poker site, known as “FORGOMO”, hit the historical jackpot on the always-popular Heavy Metal slot machine. FORGOMO was a regular player at Slotland several years ago but until he started playing regularly again about a month ago he hadn’t spun the reels for quite awhile. Obviously he’s glad he came back! This incredible jackpot breaks the record set last March when a Canadian player won $195,083 (€126,910). He was playing a Slotland favourite, Treasure Box. Slotland’s last big jackpot win was in December when a player known as ZONARIZ won $110,125 (€87,728) playing one of Slotland’s popular video poker games, Striking 7s. 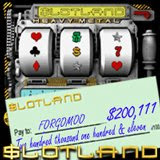 Since the Slotland jackpot is won every six weeks or so last year, many players have felt this win was long overdue for weeks. The winner isn’t sorry it took so long and is quite happy to win it when it had had time to build to the largest jackpot ever at Slotland. Heavy Metal, one of 16 unique games tied to the Slotland progressive jackpot, is a three-wheel, four-payline slot machine game. Any payline with has a bet placed on it can win. It is the first slot machine ever that allows players to place bets on their game history. While Slotland jackpots aren’t the biggest on the internet, they are hit so frequently that they are always popular with online slots players. Last year, Slotland awarded nearly a million dollars in progressive jackpot wins. Slotland’s 3D casino site, WinADay.com, has a separate progressive jackpot of its own that’s currently well over $150,000.